One of my favorite photos of the year – so like them. Garrett took them around the Newseum building for photos and this is what happened. Photo: Garrett Hubbard. Ceremony Location: Dahlgren Chapel, Georgetown University. One warning is that Dahlgren’s music director can be challenging to work with and a hired string quartet would not have been his choice of music. They also do book weddings back to back so be cautious of your set up and photo needs. Reception Location + Catering: Newseum with Wolfgang Puck Catering,Washington, DC Stephanie Retelle. Stephanie was great – very helpful and accommodating. The food is outstanding. Ceremony Musicians: Ensemble Elan. The bride used to play the cello so hiring a string quartet was important for her. One of her favorite pieces of music was Mascagni’s Intermezzo from Cavalleria Rusticana. I have to admit I love it too although I never knew the name of the piece. Floral Design: Petals Edge Floral Design. Another great job as described in Part 2. Photography: Garrett Hubbard. 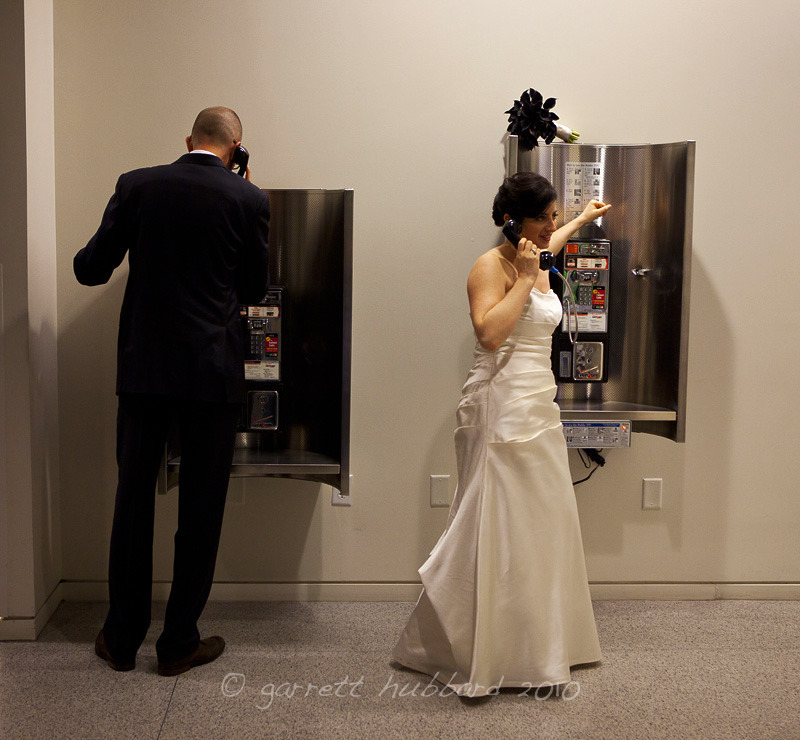 Garrett is a photojournalist for USAToday and you can see his experience reflected in his wedding photographs. Great use of light (even in a dark reception room) and creative compositions while always on the move, like a true photojournalist should be. The best part is that he is just the happiest guy you’ll ever meet. Transportation: Reston Limo. The couple was gracious enough to offer transportation between the church, Newseum and back to hotels. We needed all 3 buses and everything went pretty smoothly. DJ: Elan-DJ (Cheryl) Not to be confused with Elan Artists. Rehearsal Dinner: Vinoteca. One of the couple’s favorite restaurants. Welcome Party: A friend’s home.